In the fall of 1964 poets George Tish, Robin Eichele and Jim Semark, photographer Magdalene Arndt, musician Charles Moore, myself and several of our friends in the neighborhood around Wayne State University founded an artists’ collective called the Detroit Artists Workshop. The Artists Workshop served as an important meeting ground for musicians and other artists from the city—Charles Moore, Larry Nozero, John Dana, James Semark—with outstate natives like Lyman Woodard from the Flint area and Ron English and Danny Spencer from Lansing. Charles Moore formed a cooperative ensemble called the Detroit Contemporary 5 with Nozero, Dana, English and Spencer and began performing at the Artists Workshop and on the WSU campus. At the same time Cox was the pianist with trombonist George Bohannon’s quintet. In the creative cauldron that was the Detroit Artists Workshop we learned to develop cooperative ensembles and cross-cultural collectives, manage our own gallery and performance facility, produce our own concerts and cultural events, design and print our own books and magazines, publicize our products and productions, and keep our creative activity firmly rooted in the immediate community. It was the D.I.Y ethic in action. From the Workshop’s fertile clime germinated the Strata Corporation. 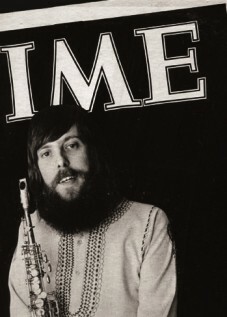 Charles Moore and Kenny Cox pooled their personal and musical resources to form the Contemporary Jazz Quintet, or CJQ, with Danny Spencer on drums. The CJQ achieved local and regional jazz success through the excellence of its performances. They gained recognition on the national scene when the band was signed by vaunted jazz label Blue Note Records. I’ve always surmised that Strata grew out of the CJQ’s disappointing experience with Blue Note Records and the general hopelessness of the surviving jazz scene. By the time Ken Cox, Charles Moore, Bud Spangler, Ron English and their cohorts had brought the Strata Corporation into being in the late 1960s, any commercial possibilities for Detroit’s creative jazz performers had shriveled to a trickle. I was living in Ann Arbor from 1968-74 but spent 29 months of that period in prison, so I witnessed from somewhat afar the initial entry of Strata. I followed its development as closely as I could since Strata embodied all of my own beliefs and principles concerning how the music could survive and continue to evolve in what was rapidly becoming the former Motor City. I was close personal friends with two of the principals: Charles Moore, my roommate and mentor during the Detroit Artists Workshop period, and Ron English, whom I’d known well in Lansing before either of us moved to Detroit. I was also well acquainted with Bud Spangler and Kenny Cox from well back in the game. Cox brought to the new collective a finely honed business sense and professional experience in banking and the construction industry, while Moore was deeply rooted in the community arts, cultural activism and collective action. Cox and Moore were involved in public radio station WDET-FM, where Bud Spangler was now employed as a staff producer. Ron English was working around Detroit with Lyman Woodard and others. The four of them bonded around the concept of an artist-controlled production and recording collective through which the artists themselves could deal with all the exigencies of the music business that affected their lives and professional careers. The core group was aided and abetted by key associates Barbara Cox, Krista English and a few others, and they began to build an organization that could attack the problems they faced as artists and entrepreneurs. Thus the Strata Corporation, its several operative divisions—most notably Strata Productions, Strata Records and the Strata Gallery—and its non-profit affiliate, the Allied Artists Association, helped keep creative music in the forefront of Detroit’s artistic community for a period of almost ten years. Strata played a seminal role in the artists’ self-determination movement in modern music. After seven years in Ann Arbor (two-and-a-half of them spent in prison) I returned to Detroit with my wife and children and a handful of associates who were eager to take part in Detroit life after the election of the city’s first black mayor, Coleman A. Young. I approached the Strata principals to suggest that I could trade work for office space, and early in 1975 I established my own desk in the Strata building. There, I carried on my artists’ management and production business as Rainbow Productions and assisted in the development of Strata Records. After several years as a radical political activist and cultural organizer in Ann Arbor it was exhilarating to be back in the sort of intensive creative atmosphere that had characterized the Artists Workshop, and with some of my most cherished comrades from that period like Charles Moore, Ron English, Danny Spencer and Lyman Woodard, for whose Strata project, Saturday Night Special, I served as album coordinator and publicist. 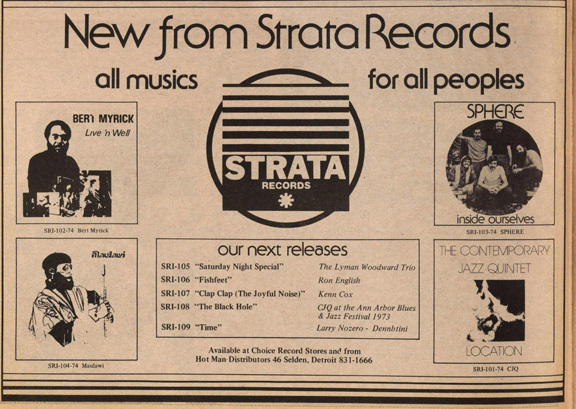 I also oversaw the design and annotation of several projected Strata Records releases, including albums by Ron English, Kenny Cox, Larry Nozero, the CJQ and others. These had been recorded and produced at the Strata complex, and I developed a marketing plan to coordinate these new releases with Strata’s existing product by the CJQ, Maulawi, Sphere, and the Bert Myrick Quintet. This scheme never reached full fruition, as Cox’s ceaseless efforts to secure backing for the Strata Corporation were not rewarded. The complex eventually ceased operations, leaving behind the materials and artistic products that are featured in this exhibit—and a treasure trove of happy memories of this historic period and the fearless men and women of Strata.